Here is my healing story and how I survived, and I will show you how you can too! Eight years before I was diagnosed with Graves’ incurable disease, I knew I was getting sick. 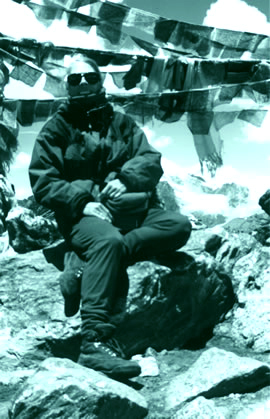 My hobby was high altitude hiking and climbing peaks up to 22,000 feet. I started to become exhausted. Doctors’ tests confirmed I was normal. I got pregnant, breast fed my baby, worked, played, and hiked while joint pain and constant colds slowly debilitated me. The final stressor, which I fought intuitively, was a simple dental X-ray. The next day I was so famished I couldn’t get out of bed; my heart was racing out of control. I trembled like a ninety year old. I could hardly walk. I had arthritis and excruciating itching. Soon my muscles atrophied , and I lost a pound a week, while eating six horse-size meals a day that left my body within a half hour. I looked like a wrinkled skeleton with protruding eyes that could not see in bright sun or night-lights. I was basically crawling because my legs could not support me. My blood test now confirmed I had Grave’s disease (hyperthyroidism). Three doctors claimed radiation, which destroys the thyroid, was my only way to stay alive. I wept. Through prayer and meditation, my guidance said I would heal and told me not to have radiation. I listened to this. A thyroid drug bought me time to meditate. I was shown that my healing path was to become 100 percent aligned with Spirit (95 percent was no longer good enough). I surrendered to Spirit to take charge of my life and followed guidance daily. This took me through experiencing the pros and cons of many forms of healing. Next, my mental attitudes needed realigning. I did not totally trust Spirit, others or myself. I felt somewhat separate, alone, not enough, unloved, etc. All of these beliefs had emotional associations of sadness, anger and fear. I had to go deeper into myself than five years of body centered therapy and do inner chakra reparenting to heal emotional levels that I had not reached. Now my spirit was deeply healing, as were my mental attitudes and emotions. But my physical body still needed more help than possible with Allopathy, classical homeopathy, acupuncture, naturopathy, and single-channel biofeedback. I had spent over $30,000 following guidance going to over 30 different doctors and practitioners and had not healed. Steadily my blood tests got worse and worse. My physician, whom I greatly respected, gave me a month to live unless I had radiation. I replied, “Spirit says that I will heal.” I had total faith in my guidance. I asked Spirit for a vision of how to heal. Two months later I jumped with joy thanking Spirit for the vision showing me how to physically heal myself as well as holistically help others to heal.My vision is now reality. My first test on the Phazyx BodyScan showed that too much radiation and heavy metals in my body was my highest stressor, more radiation would have killed me! Luckily I had listened to my inner guidance. Following all of the vision and taking homeopathy that my body created, gave my body energy to heal. In eight months I was celebrating climbing 14,000 foot peaks with my 3 year old on my back. A few months later my blood test was normal and my doctor declared me healthy!